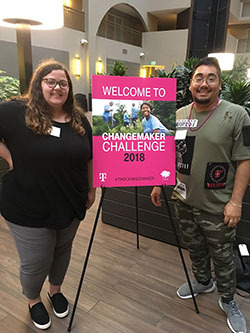 Two Northwest Missouri State University students were among 30 contestants nationwide to travel last month to T-Mobile headquarters in Seattle and share their idea to educate others about the LGBT+ community and support LGBT+ youth during the first-ever T-Mobile Changemaker Challenge. Seniors Shyla Kallhoff and David Anzures placed in the top 30 out of 330 contestants for their project, “Common Ground,” an education workshop designed to increase people’s knowledge about the LBQT+ community. Their workshop includes LGBT+ definitions, laws and policies, issues and stereotypes, and advice on how to show support. Kallhoff developed the idea for “Common Ground” from her personal experience of struggling with her own identity and being around hate and confusion toward the LGBT+ community. Kallhoff and Anzures plan to reach out to university organizations, employees and community members to start the workshops. Kallhoff also is working with Northwest Vice President of Diversity, Equity and Inclusion Dr. Juanita Simmons on a civility campaign that includes “Common Ground” training, and she was granted an independent study to research what other universities are doing to educate others about the LGBT+ community and how Northwest can improve. “We want to expand it to the Maryville community and eventually make it a standard for everyone to have competence to function as a business, organization, education, whatever that may be,” Anzures, a human services major from Shafter, California, said. T-Mobile collaborated with Ashoka, a non-profit organization that supports social change, to seek out people who want to change an issue in society and have plans to do so. At the T-Mobile headquarters, Kallhoff and Anzures participated in a “Changemaker Lab” and presented “Common Ground” to T-Mobile executives and the Ashoka team. They received feedback on how to strengthen their program and listened to others’ ideas. The lab also included workshops where participants learned more about what it takes to create change. Kallhoff and Anzures both recommend that Northwest students seek out similar experiences to inspire and create change. “My advice to students is to look for these opportunities because people are willing to support you, and companies are willing to invest in people our age,” Kallhoff said.